Cleans pool floor, cove, walls, and scrubs the waterline Recommended for in-ground residential pools up to 50 ft. in length. Ideal for free-form shaped pools or complex design features. Full bag indicator– lets you know it’s time to clean the filter Weekly timer — preset cleaning cycles throughout the week! Delayed start feature allows debris to settle for easy removal! 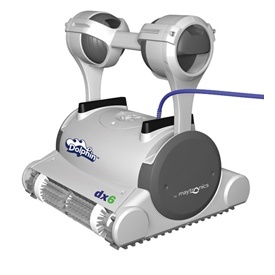 Includes Pro remote for manual navigation and cycle options Dual drive motors and split brushes for incredible maneuverability Patented swivel cable helps prevent tangling Incredibly efficient – costs less than 15 cents to clean the pool. In-store repairable right at your local Dolphin retailer! Cycle time: 2,3, or 4 hours Cable length: 60 ft. Filter: Fine porosity Suction rate: 4,233 gal (USA) per hour Unit weight: 24.25 lbs.